The tunnels of Cu Chi were used by Viet Cong soldiers as hiding spots during combat, as well as serving as communication and supply routes, hospitals, food and weapon caches and living quarters for numerous North Vietnamese fighters. 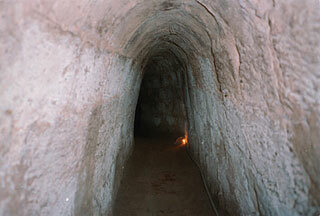 The tunnel systems were of great importance to the Viet Cong in their resistance to American forces, and helped to counter the growing American military effort. This article uses material from the Wikipedia article "Cu Chi Tunnels", which is released under the Creative Commons Attribution-Share-Alike 3.0 License.